Anyone who wants to judge how and at what speed additive manufacturing will prevail in comparison to traditional production methods needs to look back into the recent past. My comparison period is the last four years. The place is the same: Messe Frankfurt. 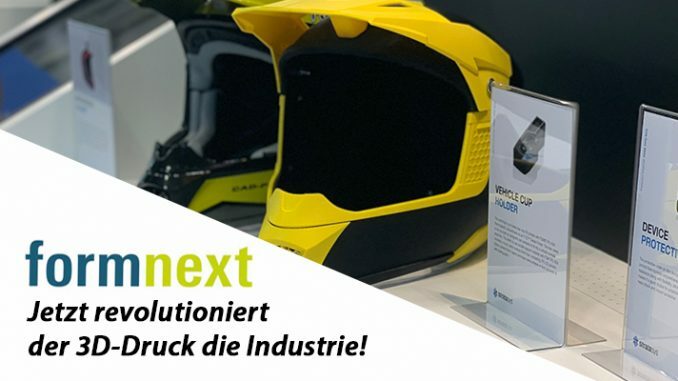 Four years ago it was Euromold that served as the leading trade fair for the 3D printing industry, today Formnext has taken over this function. One difference immediately catches the eye: in 2014 one hall was enough to accommodate the manufacturers. For Formnext 2018, two halls were already well filled. In 2018 I met many exhibitors who already showed their exhibits on large exhibition stands in 2014. For example 3D-Systems and Stratasys as industry pioneers and the German metal SLM specialists, who then as now score points with high-quality systems and innovative concepts. Four years ago, however, there were already newcomers on the road who, like Formlabs, attracted attention with their first devices (Form1). The big FFF (FDM) wave had already attracted numerous new hardware and material suppliers, some of whom are still present today. However, their number has already doubled. Then, as now, new competitors appeared with innovative products that could turn out to be “game changers”. As early as 2014, the complexity of processes, materials and new devices demanded a lot from potential users. It was almost impossible, or at least extremely time-consuming, for the individual company to maintain an overview here in order to find suitable alternatives to traditional manufacturing processes without advice. For me, this was the reason to found and establish a 3D network in 2015, in which suppliers and users should work together to create more transparency and to encourage them to work together on projects. With the initially planned regional network (3D-Druck Solingen), which I had set up with the support of the Solingen Economic Development Corporation, we apparently ran open doors everywhere. Just three years later, more than 600 companies and 15 universities from all over Europe had registered. In the future, we will be using a new network called 3Dglobal to take account of the increasing international interdependence in all areas of 3D technologies. Firstly, it is the speed of the 3D printing process that matters. Because an alternative to traditional manufacturing processes, such as injection molding, can only be developed with a significantly increased production speed. Those who expected significant progress in this respect in 2018 were not disappointed. We learned astonishing things in this respect at the booth of Desktop Metal from the USA. For the production of 1,400 Milwaukee drill bits, the production system with single-pass jetting technology takes just four hours. In the same time, 45,000 eyeglass hinges can also be printed. The machine’s price of approx. 2 million seems more than justified, especially when one considers that the material prices for the process are also unrivalled. The second driver for a more rapid spread of additive manufacturing is the price of equipment and materials, as well as all other types of expenditure, which determine the unit costs of additive-manufactured parts. Enormous progress has been made in this area. 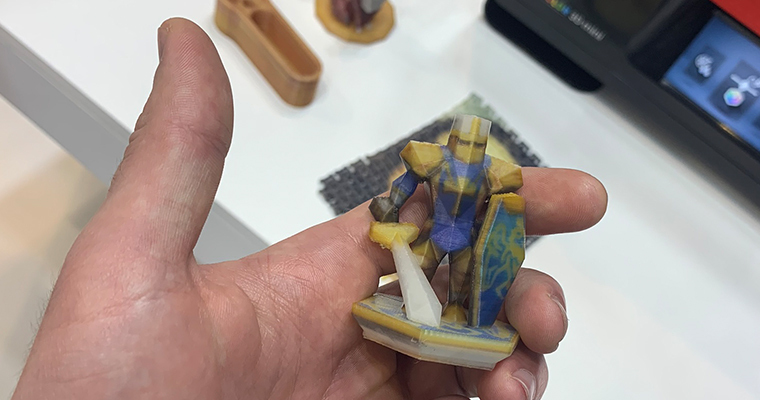 On the one hand, we see innovations, such as new devices from Taiwanese manufacturer XYZ-printing, which enable full-color 3D printing for less than EUR 3,000. In the “full color” field of application, we can now actually speak of a democratization of 3D printing. Of course, there is still a considerable qualitative difference to the printed products of a Stratasys J750. But for the price of the Stratasys top-of-the-range device, you get 83 “da Vinci Color” devices from XYZprinting. Of course it always depends on the concrete requirement, but for the users there are now potentially completely new price alternatives. 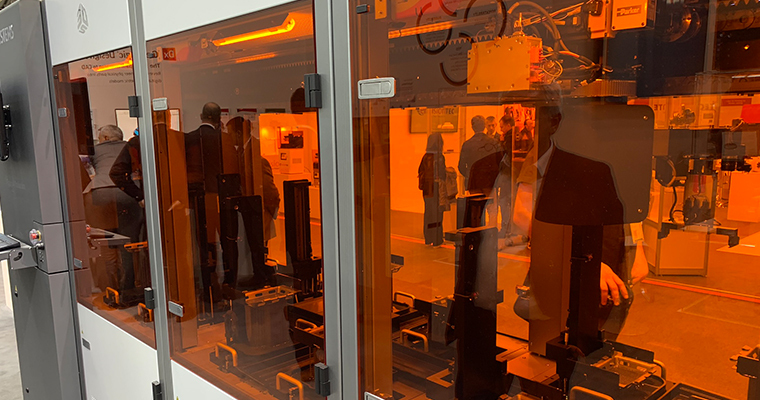 At Formnext 2018, we also observed a drop in prices for metal 3D printing, triggered by the introduction of a new technology. While in 2014 the SLM manufacturers were still among themselves when it came to “metal”, this year two opponents from the USA enriched the scene with devices that can produce metal using the FDM process: The above-mentioned US newcomer Desktop Metal with the Studio System+ and Markforged with its Metal X. In many cases, metal parts produced in this new way can be manufactured much more cheaply. Other important cost criteria such as the price of the material and the lower cost of post-processing, safety and energy also speak in favour of the new devices. However, there is still room for all metal 3D printing processes, because the products of the FDM variant cannot match those of the SLM process in some qualitative aspects. It is possible, however, that the FDM metal 3D printers will be used in completely different and new areas of application in the future. 3D printing is becoming more affordable. Medium-sized companies can now also look forward to this. 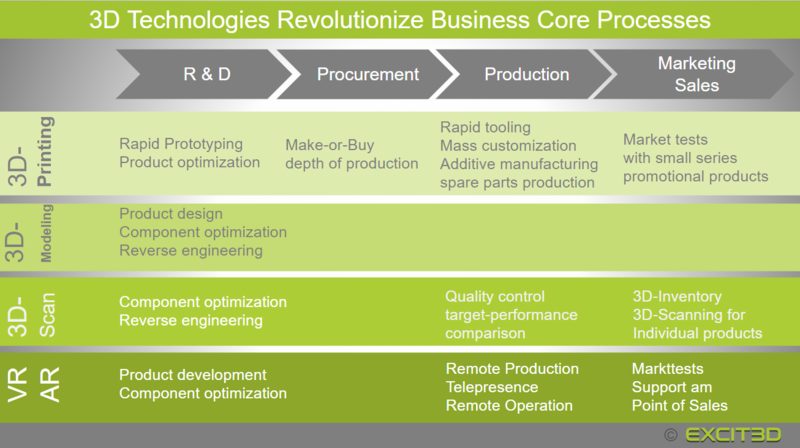 All in all, the new processes give a further boost to “additive manufacturing”. Driver number 3 is the performance of the devices and processes. This means, for example, improved performance characteristics, the versatility of materials, the quality of the products, the repeatability, the degree of automation, the consistency of the process chains, the integration with mechanical manufacturing (keyword: hybrid processes) and the scalability of the manufacturing units. 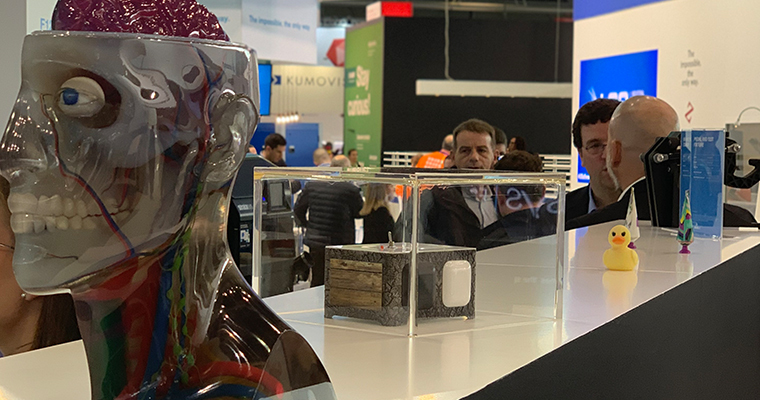 Formnext 2018 showed that the pace of innovation remains high in all areas. To list all innovations here would go beyond the scope. 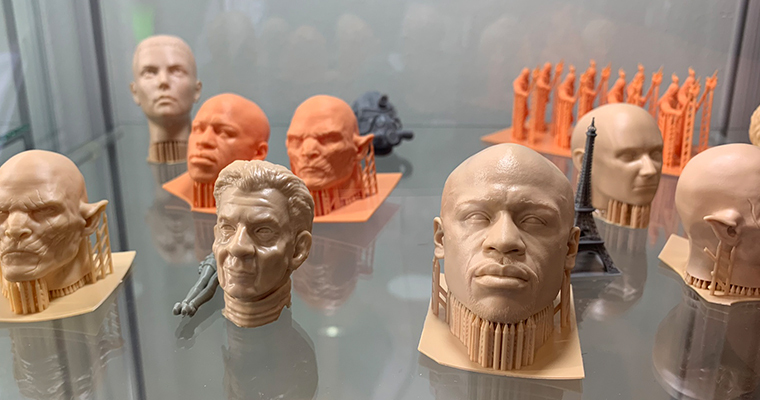 So just a few examples: The Dutch manufacturer Mimaki offers 3D printing in over 10 million colors, with results that should be repeatable and consistent. The 3DUJ-553 large-format full-color 3D printer with a print volume of 508 × 508 × 305 mm delivers smooth surfaces, extremely fine details and a resolution of up to 0.019 mm. The mechanical engineering industry was much more strongly represented this year than four years ago. Companies like DMG-Mori showed hybrid machines. For example, the Lasertec 65 3D hybrid combines additive component production with machining to produce complete components in high finished part quality. 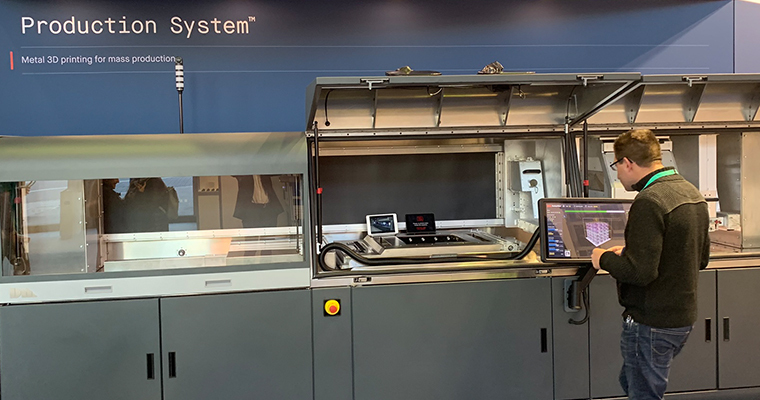 At 3D-Systems, we were impressed by the Figure 4 production platform, which enables up to 15 times higher printing speeds than other 3D printing technologies, automated material handling and integrated post-processing such as washing, drying and curing. This leads to a reduction in manual processes and facilitates automation for high production output. Compared to 2014, manufacturers and software vendors have made significant progress towards mass production. But this does not only affect the giants of the industry. Clever solutions that deserve more attention, for example, come again and again from start-ups in the Netherlands. Last year, Blackbelt developed an FDM-3D printer with a conveyor belt that makes it possible to print an unlimited number of objects for an unlimited period of time. A collection container allows objects to be printed continuously without interruption as a small series. A further advantage is that support materials are largely omitted, since the device works with a contact angle of 45 °. EXCIT3D is looking forward to further cooperation with our innovative Dutch neighbour. Formnext 2018 showed that the party continues. 3D printing is gaining ground on a broad front, as the basis for the production of large quantities of individual products has been laid. It is therefore no longer just a matter of substituting traditional manufacturing processes, but of a hardly estimable number of new applications and products in numerous areas such as medicine and mobility, to name just two. In the public perception, the consequences (see 7 theses) resulting from the growing importance of additive manufacturing are much too neglected. Instead, diffuse topics such as digitization, industry 4.0 or artificial intelligence are usually discussed in a somewhat excited manner, while “additive manufacturing” with its very concrete results only makes the headlines when it comes to topics such as “weapons”. Few people have understood that it is not the so-called industry 4.0 that achieves the quality of a new industrial revolution, but 3D printing, which for the first time in industrial history makes it possible to economically manufacture individual products in batch size 1 “on demand” anywhere in the world. I have tried to explain this aspect in my article “Why industry 4.0 is not a revolution, but additive manufacturing is”. What this year’s Formnext also shows is that the topic of 3D printing cannot be viewed in isolation. We even include 3D technologies such as Virtual and Augmented Reality in this overall complex, which unfolds great benefits for the user at many points in his value chain and makes him more competitive overall. We are at your disposal at any time for questions regarding all areas of 3D technologies. Write to us at info@excit3d.de!